Charles Glore commissioned Frank Lloyd Wright to build what would be the iconic architect’s only home in Lake Forest. When investment banker and boating enthusiast Charles Glore commissioned Frank Lloyd Wright to build what would be the iconic architect’s only home in Lake Forest, he wanted the modern Usonian structure to evoke a grand yacht at sea—with portholes looking over an expansive private ravine. Today, the couple who lives there continue to allow Wright’s landmark creation to chart a course of fun and natural exploration for their three young children. The Beidler’s home will be one of four houses featured on the Spirit of 67 Foundation’s 14th annual Opening Doors for Education Home Tour on Thursday, May 12 as they celebrate 30 years of fundraising for our area schools. Megan Beidler and her fiancé (now husband) Frank Beidler were visiting Frank’s parents in 2007 when the young architecture student saw a house unlike anything she’d ever seen in Lake Forest. They were out on a stroll with the family dogs when, just over the bridge, this low, long, mahogany and pink brick structure jutted out from the ravine’s edge, as if it had always been there. 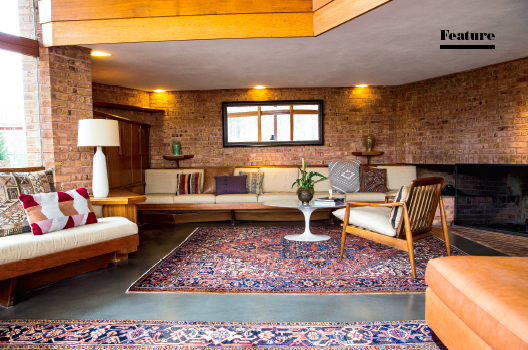 “I turned to Frank and said ‘Oh my god, that looks like a Frank Lloyd Wright’,” says Megan, explaining that the historic, 12-room, Usonian landmark had been on the market for quite some time when they discovered it. Newly engaged and already planning a move to Chicago from Los Angeles so that Frank could take a position with his family’s business, the idea of scheduling a tour of the famous property was more of an indulgence than a serious real estate endeavor. The couple originally had a trendy downtown Chicago neighborhood in mind, not a four-bedroom Lake Forest property just blocks away from where Frank grew up. But Megan says the minute they walked in, entering the compressed, low-ceiling hallway and then experiencing the release of a soaring two-story glass view of the ravine, they knew. Today, nine years and three children later, Megan and Frank continue to expand and grow within the long, light-filled home—just as Wright may have intended. The year was 1951 when Wright received the commission from Glore, an investment banker who loved yachts and wanted no detail spared in this modern ship of dreams. 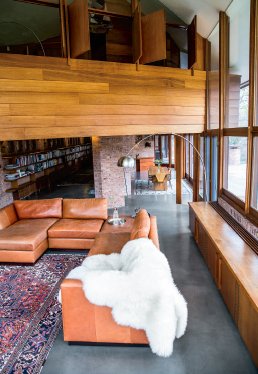 Unlike Wright’s more well-known Prairie Style, the Glore house features large plate glass windows and angles that are 360 or 120 degrees. With concrete floors, a floating staircase, and a textile block element that can be seen in Wright’s later properties on the West Coast, Megan explains that the home is not just unique to Lake Forest, but to the entire Chicago area. Sitting on nearly two acres, the house is positioned to take advantage of the southern exposure. The public side of the house is very dark and solid, with rich, oiled mahogany and “Chicago pink” brick. On the side facing a private ravine, two-story, floor-to-ceiling, single pane glass walls bring the trees and wildlife inside. And it’s in this majestic space, with a fireplace and signature Wright built-ins, that the Beidler family spends most of their time. “Frank Lloyd Wright didn’t believe in basements. He didn’t believe that people should live underground,” explains Megan. The couple says they are lucky that the home was so tastefully and authentically updated by the previous owners. In addition to updating the kitchen and turning a former “maid’s suite” into a mudroom that serves as a studio space and playroom, a three-car garage was also added. What began as an ambitious newlywed couple’s dream home has become the ultimate family sanctuary. With toy blocks spread across the floor of one room, and Megan’s childhood dollhouse holding a prominent spot on the wall of windows facing the ravine, this truly is a room for living. Tickets for the home tour and open-seating luncheon may be purchased online at spiritof67foundation.org, or on May 12, the day of the home tour, at The Lake Forest Club, 554 N. Westmoreland Road in Lake Forest, where tickets will be available for pickup beginning at 8:30 a.m. Advanced reservations by check must be received by 5 p.m. on May 5, and online reservations must be completed by midnight on May 10. No children under 16 including “babes in arms” will be admitted to the Home Tour. If you have questions, contact Amanda Lamberti at [email protected]. Celebrating 30 years, the Spirit of 67 Foundation is a not-for-profit organization dedicated to raising funds and acquiring resources to provide enriching, educational, and cultural experiences for the students, parents, faculty, and staff of Lake Forest School District 67 that might not otherwise be provided. Will there be tours during the summer months of 2016?